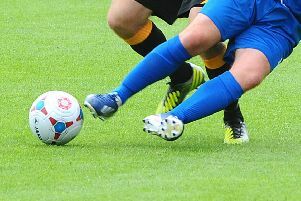 The Louth Leader Six-a-Side Premier League saw a shock as Mark Donner shocked Louth Legends, 1-0. A man-of-the-match performance from goalkeeper Rich Drury helped them to a victory which means Old Boys have one hand on the title following their 4-0 win over a spirited Marshall BMW. Steve Twidale was the difference, putting them one win from securing top spot. Manby FC are still harbouring hopes of a second consecutive runners-up spot after a 4-1 win over bottom side BF Pitches with Rees Southwood instrumental. #DS9 now look destined for relegation after losing their sixth straight game, 4-2, to OPY despite a battling display from Rob Craythorne. * In the Louth Leader Championship, Louth All Stars were docked a point for using an ineligible player and had their 3-1 win downgraded to a 1-1 draw. But the All Stars, who harbour a three-point lead, still look set for an immediate return to the Premier Division. Dragon Men thought they had done enough against Real SoSoBad, but Daniel Marsh slammed home a shot from the edge of the area to earn a share of the spoils. Is your Motherwell failed to capitalise despite a man-of-the-match performance from Matthew Mansey as Ben Maidment’s Job Centre forced a 1-1 draw. Tetney Tigers will rue missed opportunities over the last six weeks as their title challenge ended with a 1-1 draw against Ambulance All Stars who had Gary Donoghue to thank for a series of fine saves.